1. 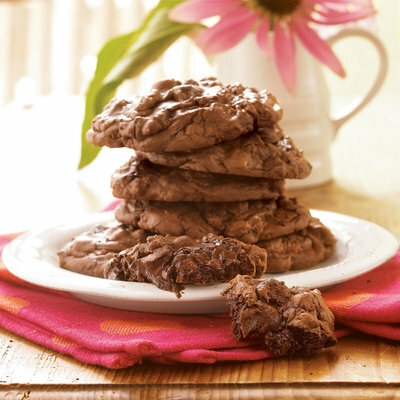 Combine butter, unsweetened chocolate, and 1 1/2 cups chocolate morsels in a large heavy saucepan. Cook over low heat, stirring constantly, until butter and chocolate melt; cool. 2. Combine flour, baking powder, and salt; set aside. Beat eggs, sugar, and vanilla at medium speed with an electric mixer. Gradually add flour mixture to egg mixture, beating well. Add chocolate mixture; beat well. Stir in walnuts. 3. Drop dough by 2 tablespoonfuls 1 inch apart onto parchment paper-lined baking sheets. 4. Bake at 350° for 10 minutes. Cool slightly on baking sheets; remove to wire racks to cool completely. P.S. Love MyRecipes.com! It tells you which ingredients are on sale at your local stores!